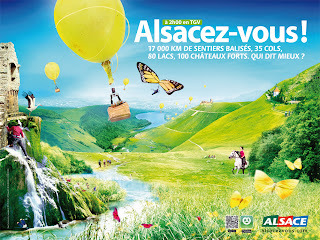 Alsace territorial marketing advert: "Alsacez-vous!" This morning, in the Parisian metro, I looked up and, for once, took notice of the ad that was on the wall in front of me. 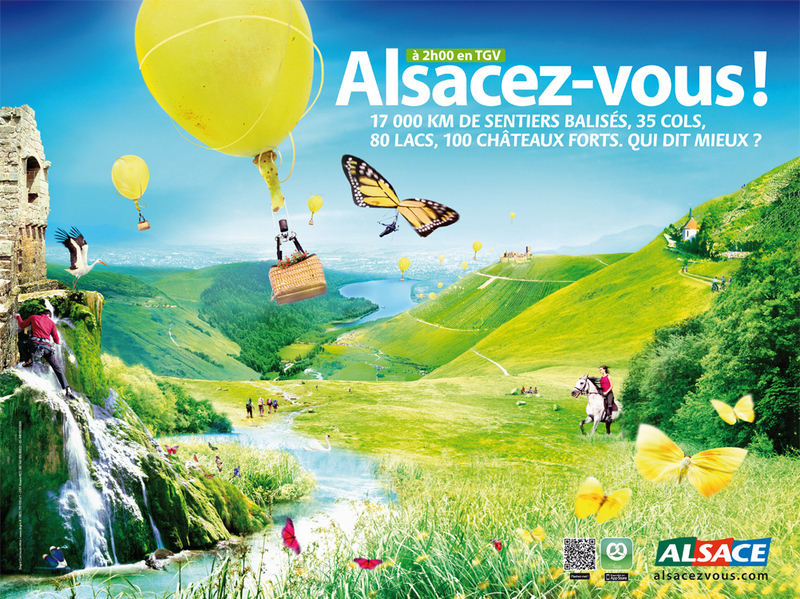 It was a big poster demanding that I should “Alsace” myself (“Alsacez-vous!”) and was clearly the latest attempt of the region of Alsace, France, to territorial marketing. It’s far from being an unattractive advert, it does have some interesting features (that I will explain further down), and it has interesting details. Nevertheless, after further study I am far from convinced by this advert. - The details given under the slogan seem a bit vague: what are Winstubs? Why only 1001 smiles? Are we supposed to know these details? There are other small problems and things I do not like in this ad but I will not start enumerating them out now. The main question I have about this ad is: is it supposed to be this surreal or is it just a lack of taste on the advertiser’s part? Again, it’s not a bad ad, far from it, it does feel magical and special and interesting, but there are just not enough details to justify this in the ad. An other advert used earlier on this year for Alsace was, in my opinion, a much better piece of advertising and conveyed a better feeling of open air and adventure (see below). I find this one more exciting despite the surreal feel to it that seems to be always present in Alsace (hand glider on butterfly wings, hot air balloons made out of fruit…). Again, the “à 2h00 en TGV” could be bigger, but at least the text and information given seems to be justified by the visual details present in the ad. Could it just be me having a preference for the color scheme on the 2nd ad? Do you think it works?